The American Heart Association’s Cardiovascular Center of Excellence accreditation "heart-check" signifies the most comprehensive level of designation for cardiovascular care. 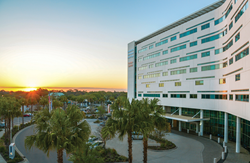 Sarasota Memorial Hospital, located on Florida's Gulf Coast is one of Florida's largest public health systems, and with 5,700 employees, the largest employer in Sarasota County. Sarasota Memorial Health Care System’s heart program is the first in Florida and fourth in the nation to receive the American Heart Association’s Cardiovascular Center of Excellence accreditation, a comprehensive level of designation for cardiovascular care. Sarasota Memorial Health Care System is a regional referral center offering Southwest Florida’s greatest breadth and depth of care, with more than 900,000 patient visits each year. Its flagship 829-bed, acute-care hospital has been consistently recognized as one of the nation’s largest and best, with superior patient outcomes and a complete continuum of outpatient care – from urgent care, trauma and emergency services to laboratory and diagnostic imaging, home health, skilled nursing and rehabilitation. SMH is the only hospital in Florida to have consistently earned the federal Centers for Medicare & Medicaid Services’ highest five-star quality award since the rating system launched in 2016. For information, visit http://www.smh.com. The Cardiovascular Center of Excellence (CVCOE) accreditation offers cardiovascular programs a model to ensure best practices and evidence-based medicine is implemented in a standardized fashion for the delivery of cohesive and consistent multidisciplinary cardiovascular care. The CVCOE Accreditation recognizes facilities with robust foundational programs in Chest Pain, Atrial Fibrillation and Heart Failure. CVCOE standards focus on the areas of Governance, Systems of Care and Clinical Quality For more information about this accreditation, visit http://www.heart.org/cardiacaccreditation.